2005 MPM AccuFlex – G-Force Technical, Ltd. 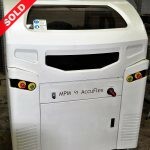 The Speedline MPM AccuFlex has unparalleled accuracy and flexibility in a compact footprint.2005 MPM AccuFlex. Very clean machine!